. . . to the Stowe Township website, where current and potential residents can easily find important Township information, discover our history and utilize our available resident resources to help us more effectively communicate with you. Stowe Township is located in Allegheny County, Pennsylvania with a population of 6,362 (according to the 2010 census). The Township is in the Sto-Rox School District, which serves both Stowe Township and the neighboring borough of McKees Rocks. Stowe Township is bordered by Kennedy Township to the west and McKees Rocks to the south. 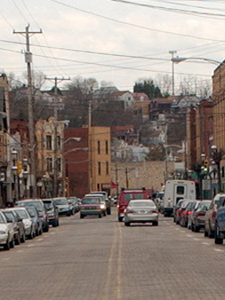 To the northeast, across the Ohio River, are the Pittsburgh neighborhoods of Brighton Heights and the boroughs of Bellevue and Avalon. Neville Island in the Ohio River is to the north, via the Fleming Park Bridge. Parks Information & Directions . . .
View Map . . .
Stowe Township is seeking applicants for summer positions within the Department of Public Works. The positions will be available to work from May until September at a rate of pay of $9.00 per hour, no other benefits. Schedule would be Monday-Friday from 7am-3pm daily. Interested applicants should pick up an employment application at the Stowe Township Municipal Building located at 555 Broadway Ave, McKees Rocks, Pa 15136 Monday-Friday from the hours of 9am-4pm. Application deadline is Tuesday April 30th. Waste Management "Bagsters" are now available for $29.95 in the Municipal Building. There is a charge for the pickup once filled.